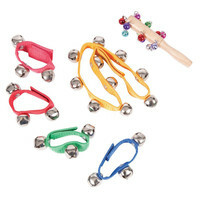 The Performance Percussion PK14 is a percussion set containing 4 wrist bells belly bells and sleighbell stick. It is ideal for schools and music groups. This entry was posted in Performance Percussion and tagged Drums-and-Percussion. Bookmark the permalink. Performance Percussion Music Box Inc Tambourine Maracas Shakers.